Let’s face it. Quite literally. I’m a girl who rarely leaves the house without a full face of makeup. Even if the look of the day is soft and natural, I’m still working with several products at a time, not because I NEED them, but because I genuinely enjoy getting my hands dirty when I’m doing my makeup. Enter the summer season, and I’m not exactly a Monet masterpiece by the end of the day. We’ve all been there when the season starts to turn this time of year. Your T-zone is a slip n’ slide outwards toward your contour and blush lines, and your foundation can’t seem to do anything BUT cling to your pores. It’s time to switch it to summer-friendly makeup. So for those of you that are in the full flush of binging on new summer products, here’s a short list from my first summer haul a few weeks back. Shade: I own 35I which is retailed as “Soft Iridescent Caramel” and it’s perfect for my light, olive skin tone. If you are slightly tan, this is good for you too. But don’t fret! MAKE UP FOR EVER hooks it up with the shade options! Perks: Long-wearing, soft, and build-able. Plus, you don’t have to worry about big chunks of glitter in this product. Nothing is worse than chunky bronzer. Pouts: I’m pretty much over the moon for this product. It’s a little pricey, but hey. 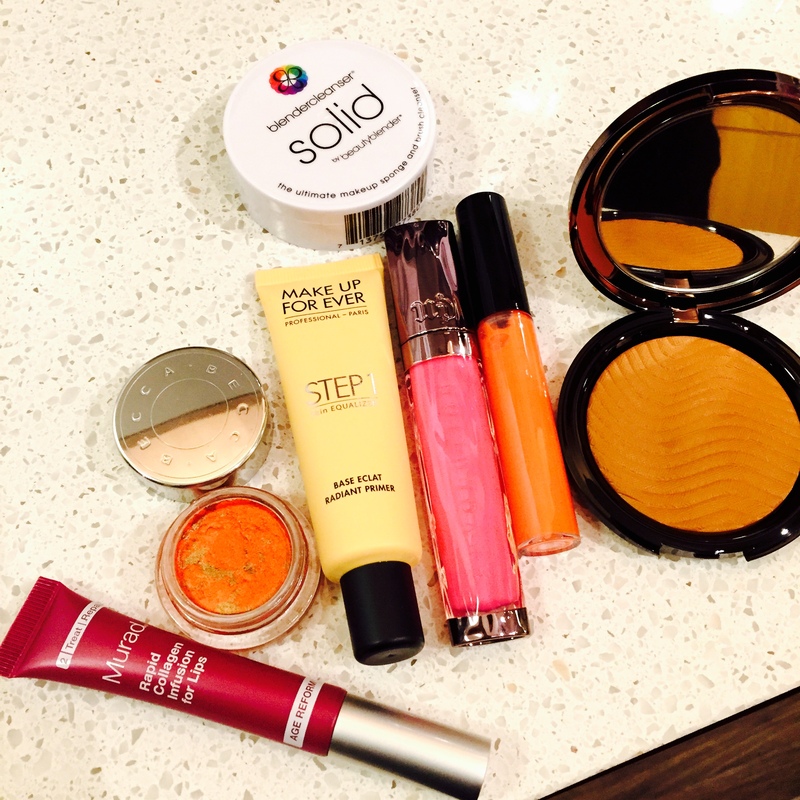 Most of us know that MAKE UP FOR EVER makes most products worth every penny. Perks: Non-greasy, and does just what it says. I use this on my cheekbones and anywhere else I’m going to highlight. It’s also a great primer to mix with your foundation for a dewy base. Perks: If you love MAC Cosmetics Lipglass, these are right up there with that quality. And I’m a fan. Pouts: The pigment is not what you see in the tube. At all. After a few coats, sure. But I was rather disappointed. While I wanted a sheer gloss and went for the sheer level of these glosses, I still expected some kind of orange or coral sheen. I did get that, but after a FEW applications. Pouts: Be positive of your shade. I wanted a bright orange blush, but these aren’t as much of a tint as they are a blush with bronzer. Fine by me, but not really as advertised. Tints should never be as pigmented as these. Perks: I’m a sucker for great packaging. And Urban Decay hits this one out of the park again. Sleek, thin, edgy little lady of my dreams. Oh, and the pigment intensity isn’t too shabby either. Pouts: I want more! Honestly, this product gives me the summery glow I expected from the MAKE UP FOR EVER Plexi-Gloss, but so much so that I am almost out of the product! The container could stand to gain a few pounds and not be so thin. Perks: I use this twice a day, before applying my lip balm and during my skin care routine. If you want a full duck face without the Botox appeal, use this. I’m quite enjoying my natural duck face. Pouts: A full one. But that’s not really a drawback. The only drawback here is the applicator. Watch the rationing of this product. It comes out quite fast and I suggest using fingers as your applicators instead. Also pictured – the BeautyBlender Solid Cleanser. Not because this is anything new to me, or a cleanser I use for my brushes in the summer only. Honestly, I don’t haul without this item. And since a lot of bloggers have been saying there are substitutions out there, I wanted to go on record and state that there simply is not a quality substitution. There, I said it. Have a great summer, dolls! Share some of your favorites, because the hot days and long nights are just beginning, and I’m always looking for makeup to carry me through the whole heatwave!